ENTER NOW TO WIN AN ALL NATURAL BEEF HOOF FROM JONES! TWEET DAILY! 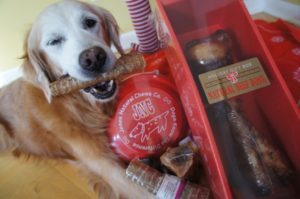 One of the best things about my job as a blogger for Jones Natural Chews is talking about the things they do to give back to the dog community. Jones loves to support dogs in need, to support dog rescue. You can click this sentence to see the list of rescues they support with money and treats every month. But the real fun, and this is where you come in, is the way Jones gives to fundraising events. Where do you come in, you ask? We’re not clairvoyant. Unless you tell us, we can’t know about your local dog rescue event. Rescues periodically host events to raise awareness and funds for what they do. The community benefits. The rescue benefits. Ultimately, the dogs and cats benefit the most. And how does Jones help with that? Jones sends treats for events, as door prizes, or raffled prizes. As giveaways. However the event coordinator decides to use them. Because Jones Natural Chews are all natural and 100% grown and produced in the USA, dog groups can feel good about asking for treats to hand out at fundraisers to support rescue. If you’d like to be considered for a donation, either for a specific event for your dog organization, or just for your favorite shelter, please contact Dee at deniseah@jonesnaturalchews.com. She’ll want your event or organization name, a flier for your event (on paper or virtually), a copy of your 501c3, a physical mailing address, and a link to your website (well, that part is for me, the blogger, so I can talk about you behind your back and make you blush). She might ask for other things, but you’d have to square that up with Dee. And guess what? Every month Dee sends me a list of events which Jones sponsors! I get to talk about them. So here’s the rundown on how we support rescue and dog organizations in January. If you want to see your group’s name in writing, make sure to contact Dee a month and a half before the event, at least, for consideration. Also, if you’re looking for a rescue to donate time or money to, feel free to click the links (the rescue names below) and check them out. Please please please – use the contact info above (deniseah@jonesnaturalchews.com) to ask about receiving treats for your favorite rescue’s fundraiser. Jones is more than happy to help if they can. Make sure you’re asking at least a month and a half prior to the event, preferably two. Share this with your animal loving friends. We appreciate it. We love to help any way we can. Now go give your dog a Jones Natural Chew! And enter the Hoof giveaway. Then have a great weekend! P.S. Thanks to our good buddy Oz the Terrier, we’re sending Power of the Paw (POTP) and prayers for our sweet friend Sugar the Golden Retriever. She’ll be undergoing surgery next Friday for removal of a tumor. We love Sugar’s Golden smile.